Spring is just around the corner and I can't wait to finally put away my winter coat and thick sweaters. This also means that I can start running again so here are some products I think help me to protect my hair and body during my run. When I run in this weather, I need a very hydrating product to help protect my hair. The freezing weather shocks the life out of my hair. I have very long Asian hair. It is straight and coarse but not as lush as it use to be. I love my hair and I love to use products that will hydrate it. I used ineco natural coconut shampoo and conditioner. I thought the shampoo was okay. It did not give me as much lather that I like when I use the shampoo. When I used the conditioner, my hair just absorbs it very quickly. I left it on for a few minutes before I washed it off. It is very liquidity and I didn't think it will do anything to my hair. I was amazed and I love how it made my hair feel silky smooth. I almost didn't need to apply any leave-in treatment on my hair. If you are looking for a face moisturizer for the man in your life, check out Man'Stuff face moisturizer. The lotion is very light and absorbs incredibly fast. It is not greasy and there is almost no scent so you can use it too. I have to apply a few layers to give the hydration that I need. When I am running, I have to protect my lips. It is mandatory that I apply a hydrating lip balm before I hit the pavement. I have to be concentrating on moving and I can't be bothered with annoying dry lips. Flexitol lip balm helped me protect my lips during my run. It has a light minty scent and has a menthol sensation on my lips. It contains Urea which it is already found in our skin. It helps our skin bind to moisture and to keep our body hydrated. This giveaway will run from March 13th to April 10th, 2018 (midnight EST). Winner, You have 72 hours to reply. You must be 18+ Canadians Only. Good Luck! Psst - Can't win if you don't answer the mandatory question. I am not responsible for shipping and handling or damages of the prize. The prize is shipped by the Sponsor and they may substitute the prize depending what is in stock. I'm in Alberta and would also love to try the Flexitol Heel Balm. Alberta. I would like to try the Montagne Jeunesse Cool Eyes Anti Puffiness. I would like to try the Montagne Jeunesse Cool Eyes Anti Puffiness. I am from Ontario. I would love to try the flexitol heel balm. I'm from Nova Scotia. I'd like to try the Zoella Beauty Double Crème Body Lotion. I would like to try the I Love Strawberry and Cream Bubble Bath. BC.... the Steripod Toothbrush Sanitizer (2 pack) sounds interesting! 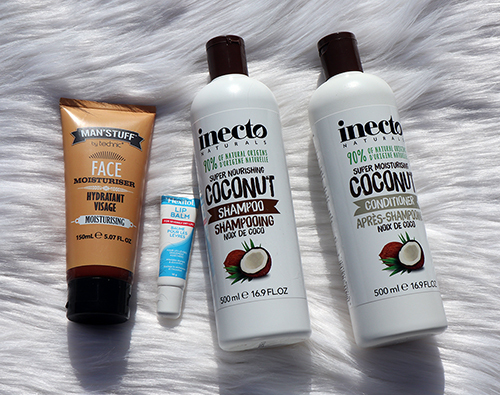 Hi,I am in Newfoundland and another product I would love to try is Inecto Naturals Coconut Bath & Shower Cream. Manitoba. Another product I would like to try is the Inecto Naturals Coconut Smoothing Body Oil. I live in Sk. and I would like to try Inecto Naturals Moisturising Argan Body Lotion. I live in NB and would like to try the Zoella Beauty Double Crème Body Lotion.. I'm from BC and love to try Zoella Beauty Bath Soak and Shower Cream. Thank you. I'm from Ontario and I would love to try the Flexitol Heel Balm, my heels are cracking. I'll make sure to bookmark it and come back to learn extra of your useful information. Thank you for the post. Tamara M- I hail from Ontario and I would love to try the MesmorEyes Natural Lashes 219 Complete Kit because I have never tried false lashes and want to give it a go! I am in Ontario and another product I like and really need is Flexitol Heel Balm. I'm in BC. I would love to try their black seaweed peel off masque. I am in Ontario. I would like to try the EcoTools Start The Day Beautiful Kit. Would love to try a heavy duty moisturizer for hands. I’m in BC and would love to try the Montagne Jeunesse Cool Eyes Anti Puffiness. I'm from Ontario & I'd like to try some Ecotools or Real Techniques brushes! I like the EcoTools Bamboo Bristle Bath Brush. I'm in Alberta and would like to try the I Love Mango and Papaya Body Spritzer. These items would definitely be great to receive after the winter we have had... and are still having! Sorry - forgot to answer the question! I am in Alberta and would like to try the banana body wash - thanks! I would love to try the Flexitol Heel Balm. I am from Ontario. I would also like to try the EcoTools Pure Complexion Deep Cleansing Facial Sponge! I am from Alberta! I'd like to try the coconut hair oil.